Hemp is a close cousin to marijuana, but it isn’t the same. Both come from the plant Cannabis Sativa L. but industrial hemp contains only about 0.3% – 1.5% Tetrahydrocannabinols (THC) – the compounds responsible for the ‘high’. Marijuana contains between 5-10%. 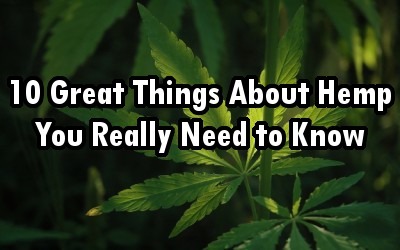 Aside from this important distinction, here are 10 more great things about hemp you really should know. About 93% of our paper currently comes from trees, often from old-growth forests, which must be clear-cut. About 40% of our trees are destroyed for timber. Each cannabis plant grown can end up saving 12 trees, and cuts chemicals used in paper manufacturing by 1/7. Approximately1 acre of hemp can also replace 2-3 acres of cotton, often grown with heavy pesticides and commercial fertilizers which hemp does not require. 3. Hemp is one of the most durable fibers on the planet – Hemp fibers are so strong they can replace metal and glass. Hemp fiber also has incredible tensile strength. Compared to cotton denim, 100% hemp fabric had 62% greater tear strength and 102% greater tensile strength. In tensile strength tests, the hemp warp endured 266 lb of pressure while the cotton only 204 lb, and the hemp filling endured 178 lb of pressure while the cotton fill only 100. In the test for tear strength, the hemp warp tested at 19.9 lb of pressure with the cotton at 12.7, and the hemp filling tested at 22 lb with the cotton filling at 7.6. Henry Ford’s first car was meant to run on hemp, and was made of hemp plastics. 4. Hemp can be used as a fuel – Hemp fuel is also better for the environment, since growing hemp is cleaner than growing the highly subsidized GMO corn which is in our ethanol gas. In the US today, about 95 percent of our ethanol is derived from corn kernels, and most of this corn is genetically modified. 5. Hemp fabric is better than many others – Hemp fibers are hollow, so when fabric is made from the plant, the fabric provides warmth in the winter and helps to keep you cool in the summer. Since it is also extremely durable, clothing made with hemp lasts longer, and will not show signs of wear and tear as easily. Hemp can produce 250% more fiber than cotton and 600% more fiber than flax using the same amount of land. The amount of land needed for obtaining equal yields of fiber place hemp at an advantage over other fibers. Our fertile lands are running out in this country thanks to Big Ag practices. 6. Hemp seed is a nutritious food source – Instead of investing in GMOs, companies should be investing in hemp! The hemp plant offers incredible nutrition. It is a great protein source, and is a vegetable-based source of all nine essential amino acids. Hemp seed protein is 65% globulin edistin, and also includes quantities of albumin. What’s more, its protein is readily available in a form quite similar to that found in blood plasma. It also contains important fatty acids, vitamin E, many trace minerals, and has the perfect Omega 3 to Omega 6 ratio of 3 to 1, which can help keep your fatty acid balance on target. Hemp is highly digestible, unlike soy, and can help heal people from immunity disorders. 7. Hemp grows fast – It takes hemp about 3-4 months to grow to full, harvestable size, and the same acre of trees years to grow back before they can be used for the same things as the hemp plants would have been. Interestingly, our forests are being cut down 3 times faster than they can grow back. You do the math. 8. Hemp can be grown without pesticides, herbicides or fungicides – The use of these agrochemicals is epidemic. Just glyphosate use alone is up to over 383 million pounds annually and growing. Hemp cultivation can help to restore nature’s balance by stopping the use of these poisons. 9. Hemp is medicine – The Medical College of Virginia had been funded by the National Institutes of Health to find evidence that marijuana damaged the human immune system. Imagine their surprise when the results came back indicating the opposite: Instead of causing the death of mice implanted with brain cancer, marijuana considerably slowed the growth of their tumors and extended their lives, but even hemp, the non THC-full counterpart to Cannabis, harnesses healing properties. Hemp/Cannabis juice is rich in CBD. Many people juice with hemp and see some amazing benefits. 10. Hemp is still illegal to cultivate – While there have been some advances with the Industrial Hemp Farming Act of 2013, which allows certain states limited ability to grow hemp, as long as the dried plant has delta-nine tetrahydrocannabinol concentration of not more than 0.3 percent, it is still a federal crime to grow hemp, and it is classified as a ‘dangerous’ drug. Say What! ?